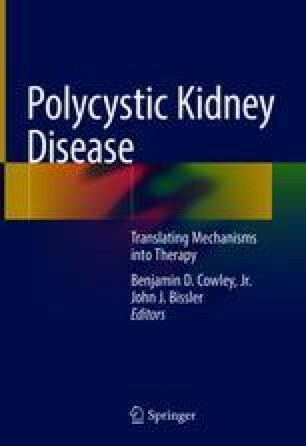 The polycystic kidney disease genes, PKD1 and PKD2, in the autosomal dominant form of the disease (ADPKD), and PKHD1 in the rarer, severe recessive form (ARPKD), were identified ~20 and ~15 years ago, respectively. Since then, advances in the description of the protein products of the PKD genes, engineering of different murine models, and genotype-phenotype correlation studies in patient cohorts have enhanced our understanding of pathogenesis and the course of these life-threatening disorders. Here, we provide an update on PKD gene structures, mutation spectra, and related phenotypes, as well as on the structure, localization, trafficking, and functions of the PKD proteins, polycystin-1 and polycystin-2 (ADPKD) and fibrocystin/polyductin (ARPKD). We also discuss insights from rodent models in both diseases, and particularly how they have underlined the importance of allelic dosage in ADPKD and helped to decipher the conundrum of phenotype variability. Our hope is that the upcoming identification of modifier genes will further help to unravel new pathways and identify key determinants acting in PKD pathophysiology. These studies are supported by funding from the NIDDK (DK058816, DK059597, DK079856, and the Mayo Translational PKD Center: DK090728), the PKD Foundation, the Zell Family Foundation, Robert M. and Billie Kelley Pirnie, and the Mayo Clinic. ECLG is a recipient of an ASN Kidney Research Fellowship. Harris P, Torres VE. Polycystic kidney disease, autosomal dominant. GeneReviews [Internet]; Genetic Disease Online Reviews at GeneTests-GeneClinics (University of Washington, Seattle) http://www.genetests.org/ 2015 [updated 2015]; Available from: httw://www.geneclinics.org. Autosomal dominant polycystic kidney disease mutation database [database on the Internet] 2015 [accessed October 2015]. Available from: http://pkdb.mayo.edu.